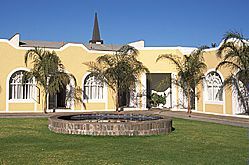 The Central Lodge Keetmanshoop is ideally situated in 5th Street, right in the historical centre of Keetmanshoop and very close to the old "Kaiserliches Postamt". 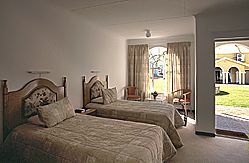 For your convenience Central Lodge offers spacious rooms, all equipped with en-suite bathroom (3 luxury rooms also equipped with spa-baths), air conditioning, telephone for internal and external calls, 6 channel colour television, coffee machine with pure coffee, settee for two persons with coffee table, luggage rack, wall to wall carpets. 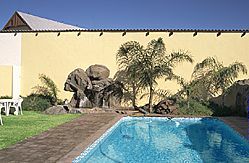 Facilities include a la carte restaurant, fully equipped and licensed that open throughout the day, an outdoor swimming pool, secured indoor parking. Conference facilities free of charge equipped with air-conditioner, television, video, flip chart and overhead projector. Juice served on tables free of charge. Connected to the conference room is an indoor braai area. E-mail facilities.